Gist has always had the ability to email your list, as well as collect email addresses. 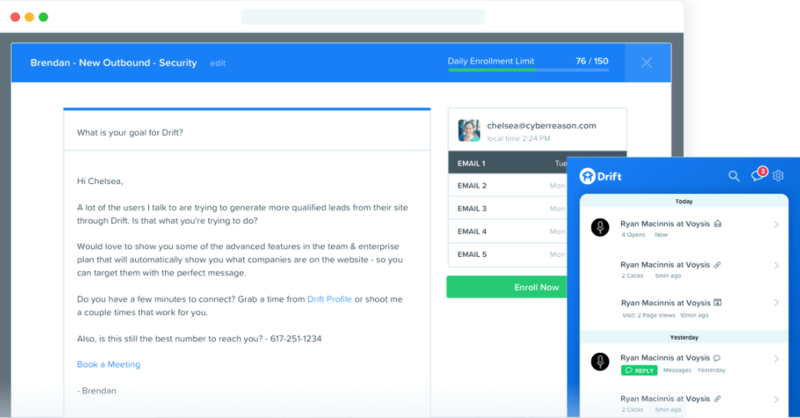 Recently, Drift also released an email marketing tool. That said, there are some big differences between the two. For instance, Drift’s email is meant to deeply integrate (and even function similarly) to their chat feature. The email is not geared for sending broadcasts, regular updates or even drip campaigns. But rather, this feature is meant to be a part of the nurturing and communication of leads. 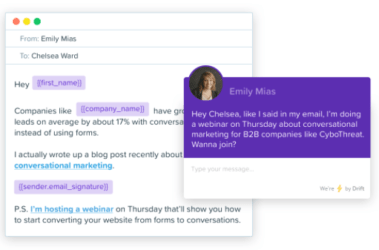 Gist’s email marketing tool is more traditional and pairs well with several other features offered — like forms and automations. 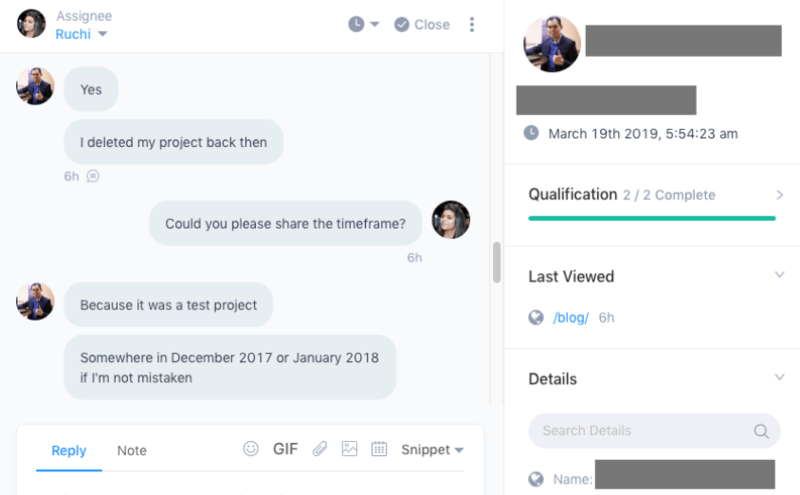 Drift’s feature is useful if you only plan on using email for a more one-on-one basis, but there isn’t a lot there for those who want to build their list. If you’re looking to be able to really narrow down the communication with each lead via email and chat — Drift could be a viable option. But if like most organizations, you feel “the money’s in the list”, Gist is the winner between the email marketing tools. 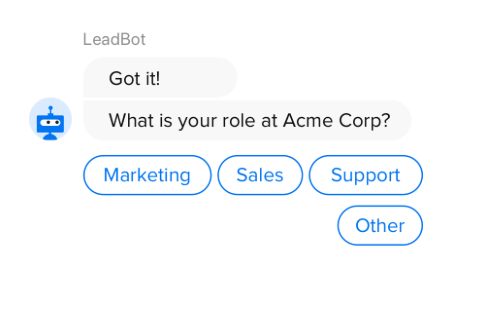 Drift is primarily a live chat and bot tool for connecting to and starting conversations with leads. Gist’s live chat is definitely one of our most used and valued features on the platform. Gist directly integrates with Facebook, allowing our users to seamlessly converse with potential customers on their terms. Drift does not offer a direct FB connection. Drift has a clear advantage in the ability to deliver messages to the right leads from the right reps. Teams can be easily organized allowing for better in-house segmentation. 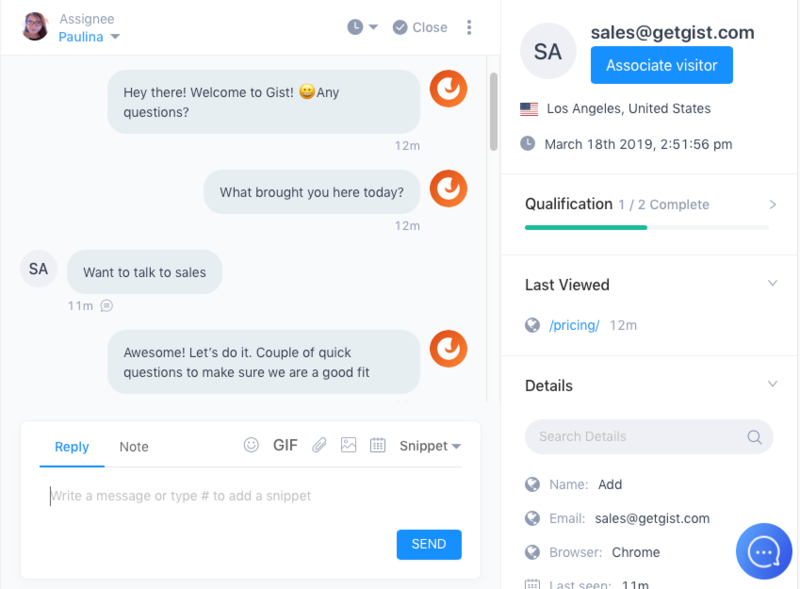 Gist allows for many direct integrations with our chat functionality, but Drift squeezes by us in terms of how well their chat works with the rest of their suite. Chat is the core feature of Drift and they’ve done a really good job of ensuring every other feature compliments that core. For this reason, we give the nod to them in the chat category. Gist and Drift have functionality for customer support. 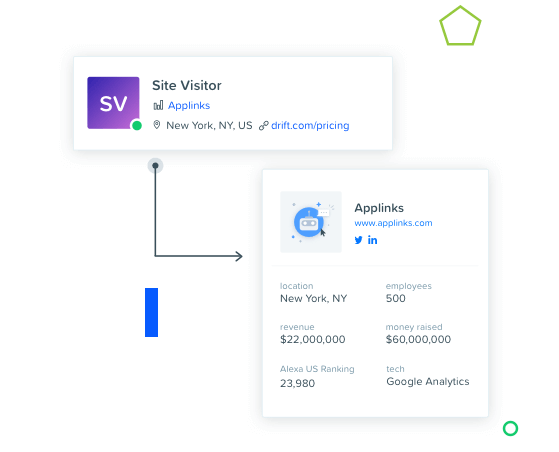 While you may be able to use Drift’s tool to handle incoming concerns from current customers — it’s not as well integrated with it’s other tools. 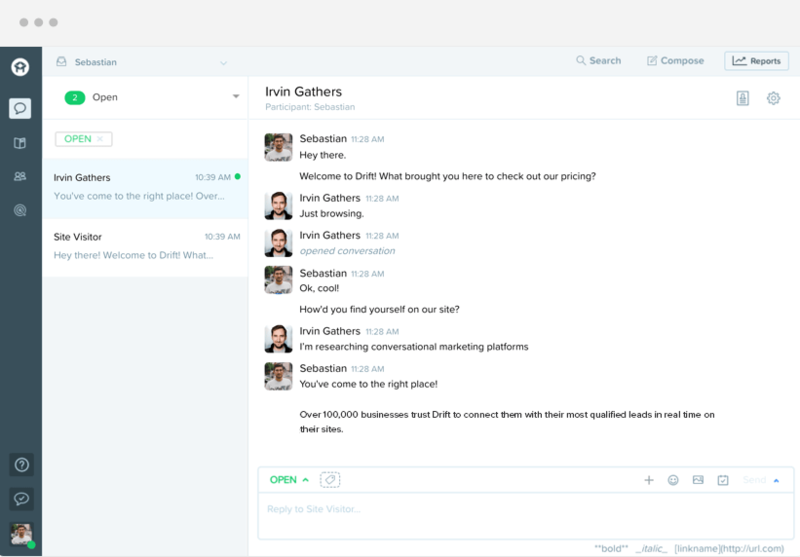 Drift’s chat is primarily for handling inbound leads and nurturing them towards a purchase and closing the sale. The chat support is good, but it’s an add-on. 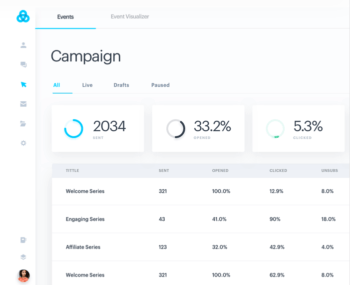 Drift offers email marketing and certain analytics, but these features are not intended to be used for support. While they probably could, it’s not direct. With support being functional, but not seamless, Drift takes 2nd place here. Gist provides the ability to better support your customers. The big difference comes in the integration of Drift’s knowledge base with their bot tool. Bots are quickly and easily created to offer support and direct site visitors to relevant knowledge base articles. This is possible with minimal effort with Gist’s bot creator as well. However, the ease at which Drift allows you to do this is better. 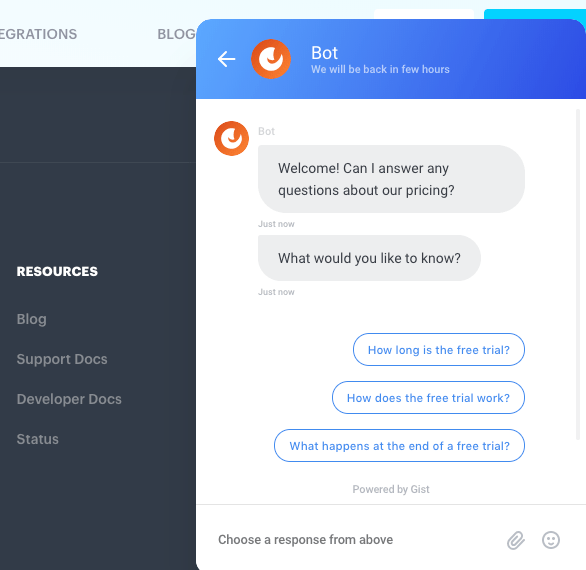 Drift’s knowledge base tool is free — But bots are only on certain paid plans. Unless you’re wanting to pay for the bots (starting at the $400/mo plan! ), it’s actually a very lightweight knowledge base tool. After you remove the bots, due to price, Drift and Gist have a very similar knowledge base. Users could create bots far cheaper with Gist, but we’re comparing apples to apples here and there isn’t a clear winner. Both Gist and Drift offer a meeting tool. And both are geared to the marketing and sales teams of a given organization. Both tools allow users to book meetings directly from live chat and bots. In terms of differences, Drift pulls slightly ahead in this category in design. In addition to the “automated booking” feature offered by both tools, Drift helps book more meetings in a less hands-on way. They do this by offering “one-click” scheduling right within emails sent to prospects. This is something that Gist doesn’t currently offer. A potential drawback is Drift’s pricing. The calendar doesn’t go into chat unless you are on the $50/mo plan and the automated bookings don’t come in until the $400/mo plan. 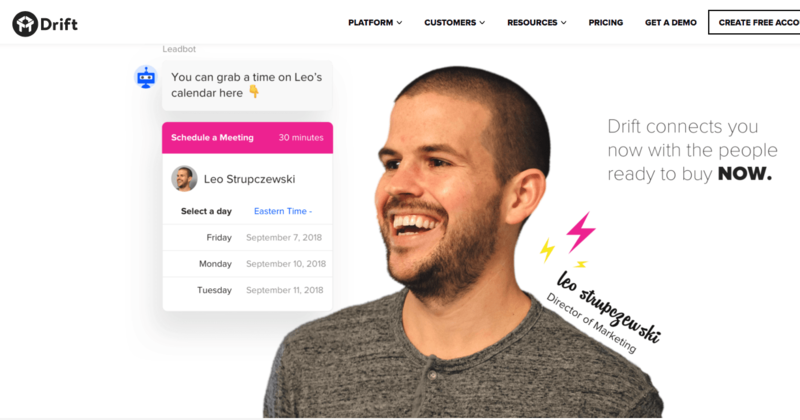 Basing it solely on the calendar functionality within email, Drift wins the meeting category. 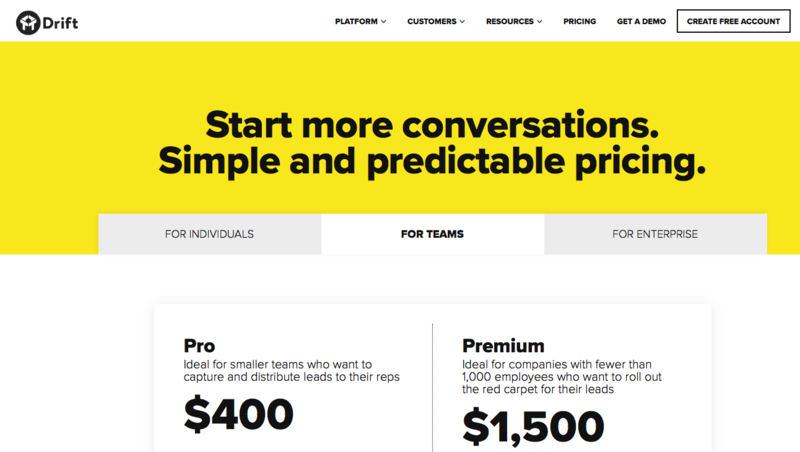 And for sales teams in some organizations, it may make sense to pay for that sole feature. Marketing automation is the ability to cause a series of actions based upon one or more event. Drift has some functionality that allows events that happen on site to trigger actions, but there isn’t a feature labeled “marketing automation”. Gist offers the ability to use pre-set automations or create new ones based on events that you create and control. 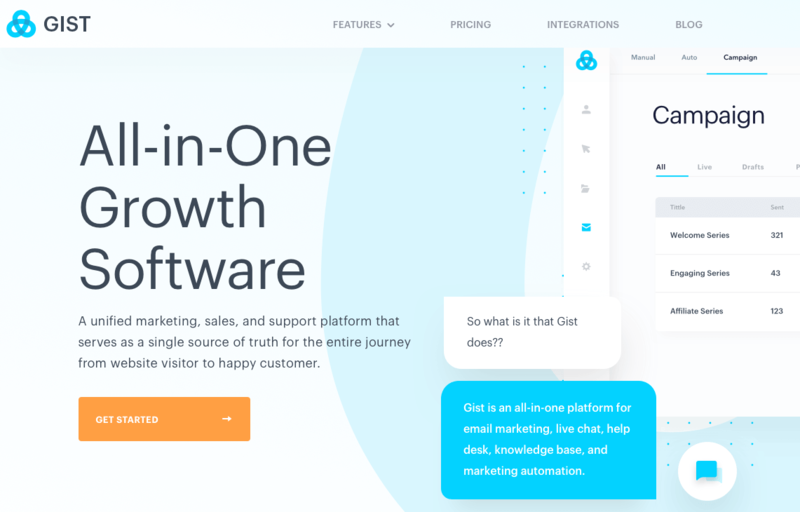 Drift’s automations are powerful (and really cool) for lead nurturing on a one-on-one basis, with a decent bit of direct interaction from sales reps.
Gist allows for lead nurturing automations to be both personal and/or scalable. Not to mention the marketing automation capabilities for sales and support. This is very powerful for shortening sales cycles. Both Drift and Gist offer event tracking with these capabilities. 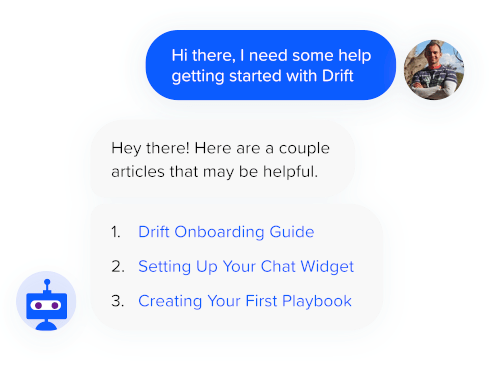 Drift pulls slightly ahead with the ability to automatically pull some of this data into chat interactions. For instance, you can pull someone’s first name, company name or company URL and display that when a new visitor comes to your site. This level of personalization can be incredibly effective and gives Drift the upper hand in terms of event tracking functionality. However, being able to use the data like this starts at the $1500/mo plan. Based on features alone, we have to give it to Drift. That said, the price is too steep for many smaller organization and Gist offers the same data and event tracking. 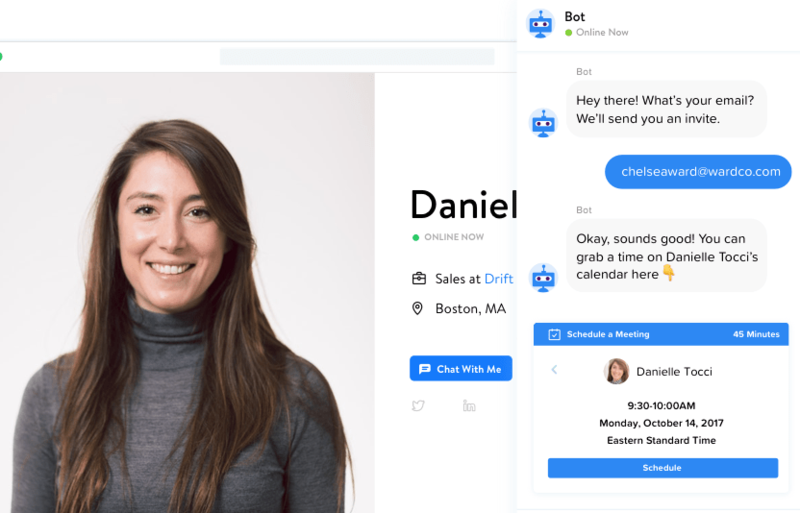 Live chat may be Drift’s main focus, but bots come in at a close second. Their bots are intuitive, not-to-hard to create and really powerful. Gist does offer easy bot creation as well as detailed options for display conditions. The bots users create show up exactly when and where they are meant to be displayed. In order to have the ability to create these bots you’ll need at least the $400/mo plan for Drift and the $79/mo plan for Gist. 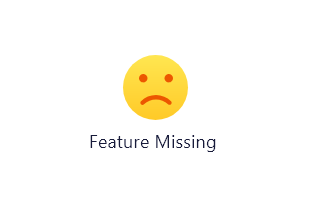 functionality that isn’t available with Gist, at the moment. With Drift, you can choose from a few pre-build bots. Or, book meetings directly from qualifying bots. While similar functionality is in the works, these features aren’t available with Gist, at the moment. Based on features and functions, gotta give this one to Drift. Live chat and bots are Drift’s bread and butter. They do these things very well and command a premium price tag for the full suite of tools. Drift doesn’t offer forms. In fact, they often compare them to locks on the door of a business. Forms can seem like a lock, but when used right, they can be the start of an automated funnel. It doesn’t seem like Drift will offer forms anytime soon, but we plan on keeping and improving our current forms feature for the long haul. While this is a feature we intend to release this year, Gist does not currently offer a specific sales sequence tool. Drift continues to focus on the acquisition of customers and does offer the ability to do email outreach and draw otherwise unaware leads into your marketing funnel. Kudos to them and we’ll have our sequence feature up soon. Obviously, we can’t win if it’s not available…yet. Comparing the pricing of powerful tools, like Drift and Gist, can be difficult. But let’s break it down from the lowest cost to the greatest. Lowest Cost: Both Gist and Drift have a free plan. Gist’s highest-priced plan is $79/mo and with it, you get everything we offer now and in the future. Drift actually has three more plans — $400/mo, $1500/mo and custom Enterprise plans. 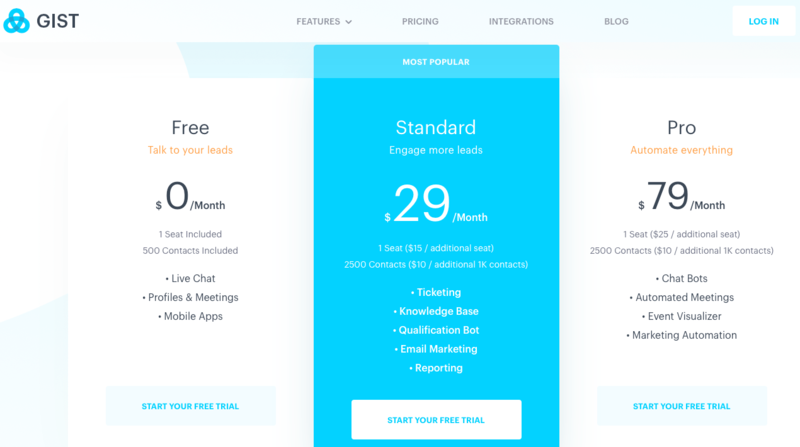 Since you may have read this entire comparison, we won’t go over every single detail of the large plans of these multi-faceted marketing, sales and support platforms. Drift has a lot of awesome functionality that really melds well together within all of their individual tools. This functionality has also been a heavy factor in creating their pricing, which is on the higher end. While Drift has many advantages, they are not different enough from Gist’s capabilities to warrant such a price difference. This was a difficult and fulfilling comparison to write since Drift and Gist are really evenly matched. That said, with similar products there aren’t really similar price points. Gist is just way more affordable and you unlock all of the potential for $79/mo. There is no $400 or $1500 plan with Gist, but there is with Drift. With it coming down to price, Gist wins the overall comparison with Drift. Interested in switching from Drift to Gist? Here’s a guide for migrating specifically from Drift.